I remembered that I had visited the Dragoon Gecko (DG) web site in 2011. 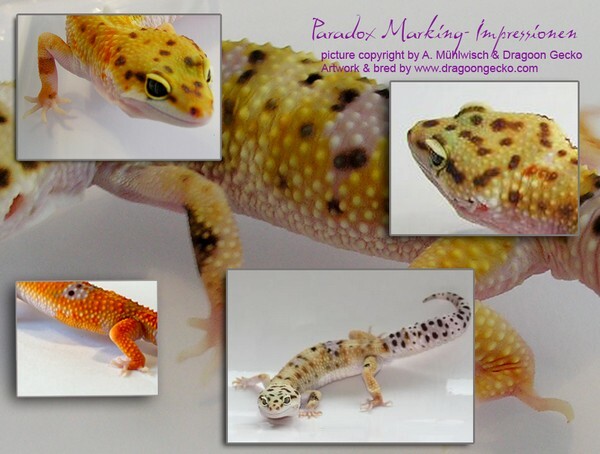 Although it was in German (and my college German isn’t only rusty—it has died along with my Irish whiskey-damaged brain cells), I was fascinated with the scope of the DG projects and the fact that one of the most interesting aspects of their hobby was maintaining older, less commercial lines of Leopard geckos. “What a concept,” I remember remarking to no one in particular. So this is NOT a “quickie” interview. That approach is not feasible or even possible in this instance. And, yes, you can still head over to the Dragoon Gecko web site ( dragoongecko.com ) to see how your own German language skills have survived (or not). Anyway, Rebecca promised me there will be an English version of their homepage available, and it just came online on November 2013 :-). I’ll see if I can do justice to two fascinating young women who are veterinary medicine students at the university in Vienna, Austria. Rebecca has always had an interest in genetics. Her approach to breeding geckos is outlined in a Gecko Time article, so I will not repeat any of that essay. She offers sound and practical advice that applies to Leos and any species you care to cultivate. Read that article, please. “I still believe staying open minded and regularly reflecting on your current work . 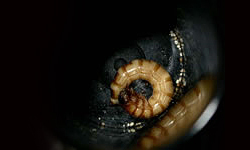 . . is the key to good breeding work in the long term. There’s always something new to learn, or something you can improve.” Wise counsel, indeed, from an impressive young gecko breeder. Like many of us, Rebecca had experience with other species before venturing into the gecko hobby. She bred both guppies (poecilia reticulate) and bettas (Betta spendens) for show competition. It is worth noting that she bred the first lilac crowntails in Europe and was also one of the youngest betta breeders in that hobby at the time. She attributes much of her success to some of the most talented and experienced fish breeders in her country who were willing to share their knowledge with her. It seems she is following the example set for her by those breeders. 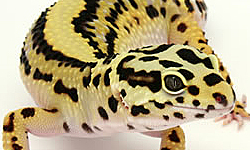 Rebecca started with Leopard geckos in 2000, breeding the wild type available to her at the time, but transitioned to the color morphs in 2005. 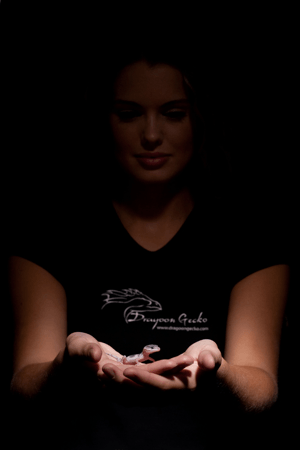 She met Martina in 2006, and founded the Dragoon Gecko partnership with her in 2007. It was at that time she discovered a passion for rare or almost forgotten, as she calls it – “good old” stuff. 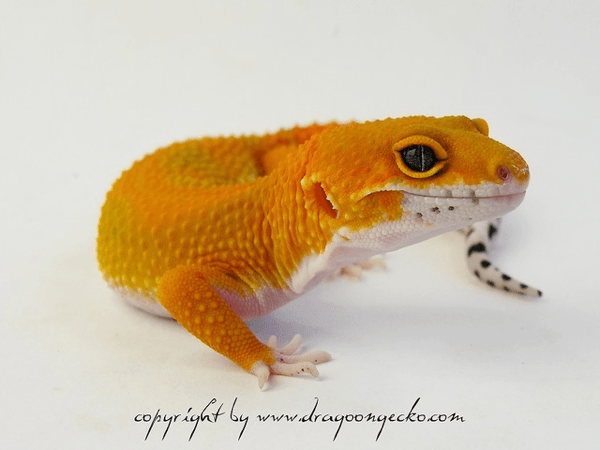 Although producing nicely colored geckos was important, being able to produce and maintain a strong, fertile and healthy bloodline of animals was even more crucial to the Dragoon Gecko partners. DG moved some projects along more slowly because they invested time in regular out-crossing along the way; those results have always been worth the time spent. 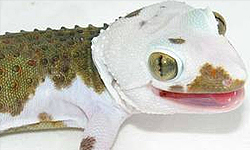 The “Four Eyed” morph– first described in Ron Tremper’s book The Herpetoculture of Leopard Geckos as a specific head pattern. Rebeccas’s first line-breeding project was founded on European bloodlines that she almost abandoned due to space problems. It was the appearance of some extremely dark animals and nice lavender morphs that kept the DG partners working with the Four Eyed geckos. Up to the present, she has not seen anyone else working on a Four Eyed line beside DG. Therefore, the Four Eyeds are one of the few old European Bloodlines left.. They took one of the best dark females from the Four-Eyed line and crossed her into the famous “Black Velvet” line in 2009. One of the females from this cross is being used in their projects to date. The use of some of the lavender morphs from this line, crossed into other high quality lavender Leos, has produced some nice results! Her work on this line was published in the book „Il geco leoardino“ by Mauro di Grano and Emanuelle Scanarini in 2009. 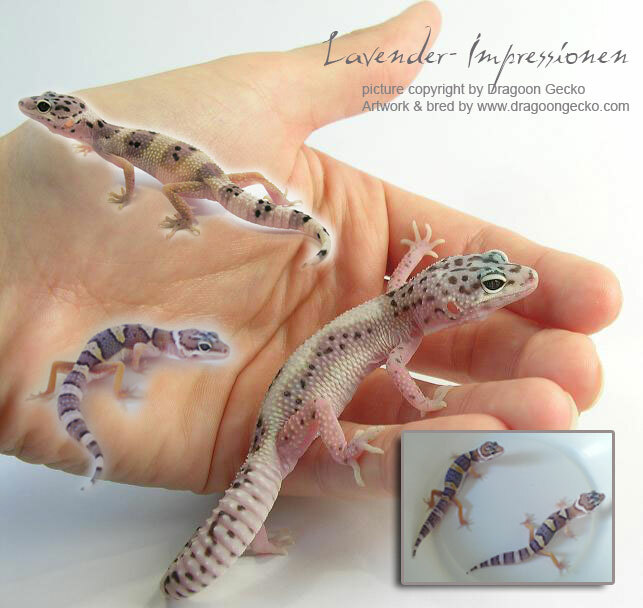 Lavender Line – a colour morph still very hard to find in good quality. Rebecca has always had a weakness for them; therefore, she has been working hard to improve them. She has seen good progress in the last few years, but states that the lavenders will always be a work in progress as Lavender is very hard to fix. She is still far from the goal she wants to achieve one day, but the joy of working with a complex polygenetic morph she loves keeps her focused on that goal. Her work with that colour can be seen, for example, in her Lavender Ghosts and Linebred Snows. 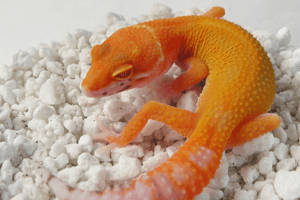 Electric Tangerine Line – the world famous Tangerine line developed by Kelli at HISSS seems to be more polygenetic than others, and Rebecca asserts that they are sometimes tricky to breed consistently in high quality. The young geckos produced over the past years have had exceptionally nice color and contrast, so Rebecca hopes she can develop and improve the line a little further and continue Kelli’s work in the future. 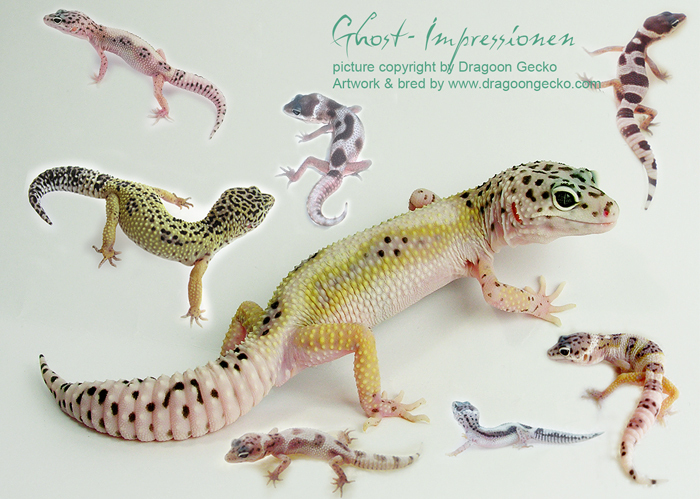 Ghosts– a rare and almost forgotten ”old“ mutation sold and promoted by Alex Hue, that Dragoon Gecko has been able to improve over the years, as described in a Geckoforums.net thread. They crossed the Ghost into various projects and produced improved variants like the Speckled Ghosts, Lavender Stripe Ghosts, Giant Ghosts, Ghost Raptors, Montanus Ghost Raptors and many more. The newest addition is the combination of the Lavender Ghosts with the Albeys Linebred Snow line in 2013. Rebecca says she has always seen a great potential for the Ghost morph, as they tend to influence other color morphs in a similar fashion to the effects introduced when the enigmas and W&Y’s are used in a cross. Many of DGs non-albino Ghosts show much more green than any current emerald/emerine line they’ve seen. Some Ghosts show tons of lavender, and, in 2012, the Ghosts gave the partnership some amazing eye patterns when crossed into the Montanus Line. One effect of DG’s work over the past years is that the Ghost morph is now recognized inside and outside Europe, and that people all over the world are becoming more interested in them lately. Rebecca states that it gives her great joy that her work with them has allowed other breeders to see what treasures they have in the old and almost forgotten morphs. This passion for valuable older morphs was the reason for my interview with Rebecca. We often move on to the newest morph and abandon the older mutations. Not so Rebecca and Martina. A & M (Giant) Hyglos – another almost forgotten old bloodline!! Rebecca’s heart still beats for the Hyglos and always will, so this project will be a main focus for DGs the future. 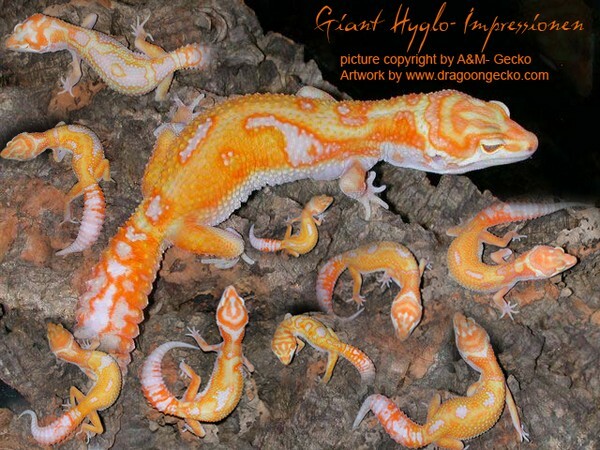 The Hyglos, once so popular in 2005 and the following years due to their high contrast of cream and orange, literally disappeared worldwide after A & M Gecko ceased breeding geckos. DG has been searching everywhere for the last remaining Hyglos, and, after much time and effort, were able to collect some of the last remaining specimens of proven origin and in high quality. They also purchased a high quality pair which came directly from Alberto in 2007. Due to their research, this pair is the very last one of high quality coming directly from Alberto where the origin can be 100% proven by the original A&M pictures & various old forum posts of the previous owner. DG’s goal is to preserve this fantastic bloodline for future generations, and, hopefully, to continue Alberto’s fine work. 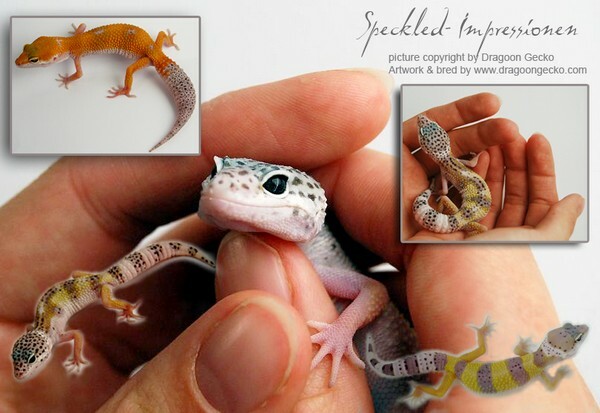 Dragoon Gecko’s Speckleds – almost forgotten but still worth working on, the DG Speckleds, to their knowledge, was the first genetically fixed speckled line, founded in 2005/2006 from a fine speckled, wildtype female that passed that dominant trait to her offspring. They have created some nice variants by crossing this line with Ghosts, Electrics, Lavenders, etc. over the years, and like their “Four Eyed“ line, the Speckleds are a strong and fertile line they enjoy working with. Of course, DG is also working with other “old stuff“ in small numbers, such as geckos with Paradox Markings or Desert Gem’s Tangerine line. They usually have one or two “secret projects“ in progress based on polygenetic phenotypes coupled with the use of well planned line breeding to fix the traits. 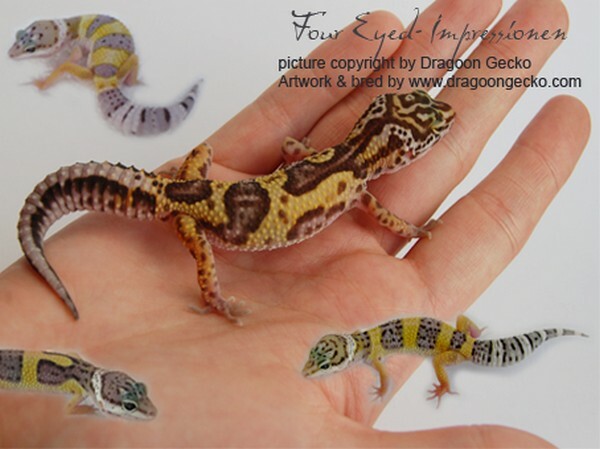 New for Dragoon Gecko in 2013/14 will be to work with Albey’s Line Bred Snow line as well as some top quality, selected W&Y combos with unusual backgrounds such as the W&Y Electric & W&Y Electric Emerines. 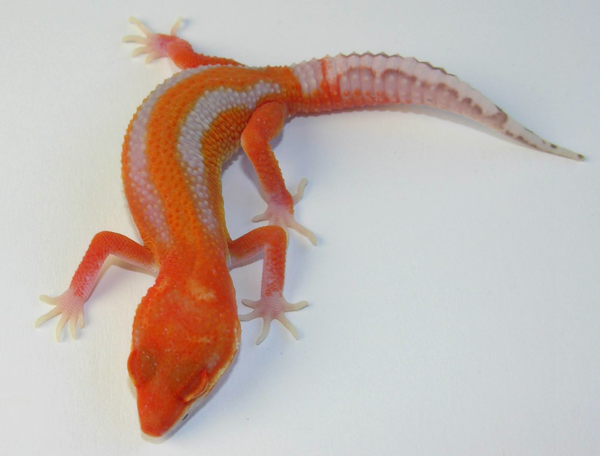 Rebecca is excited about the potential for Albey’s Snows, as she has always loved them and because she notes that they are rare these days with all of the newer morphs capturing the fleeting interest of gecko breeders. DG will cross them into some of their projects, and they look forward to the resulting offspring. But isn’t that what we all look forward to every year? They also support new projects that need more attention in Rebecca’s opinion, such as the “Neon Bells.“ This line is, simply put, wonderfully awesome geckos! They have a very nice group they bought in 2011 and 2012, and will take over the whole project in 2013/2014. More information can be found here. It should be apparent by now exactly why I couldn’t call this a “quickie” interview or an interview at all. My hopes as a writer are simple: that we all become aware of the good old stuff still alround, and the breeding efforts from fellow breeders in other parts of the world.